Something startling is happening in the Muslim world — and no, I don’t mean the Arab Spring or the growth of Islamic fundamentalism. According to a leading demographer, a “sea change” is producing a sharp decline in Muslim fertility rates and a “flight from marriage” among Arab women. Nicholas Eberstadt, a scholar with the American Enterprise Institute, documented these findings in two recent papers. They tell a story that contradicts the usual picture of a continuing population explosion in Muslim lands. Population is indeed rising, but if current trends continue, the bulge won’t last long. 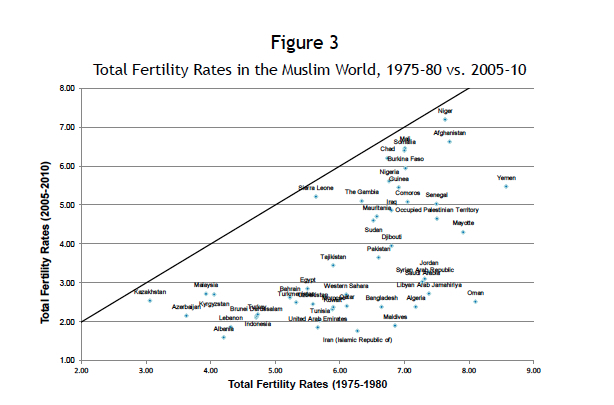 Eberstadt’s first paper was expressively titled “Fertility Decline in the Muslim World: A Veritable Sea-Change, Still Curiously Unnoticed.” Using data for 49 Muslim-majority countries and territories, he found that fertility rates declined an average of 41 percent between 1975-80 and 2005-10, a deeper drop than the 33 percent decline for the world as a whole. 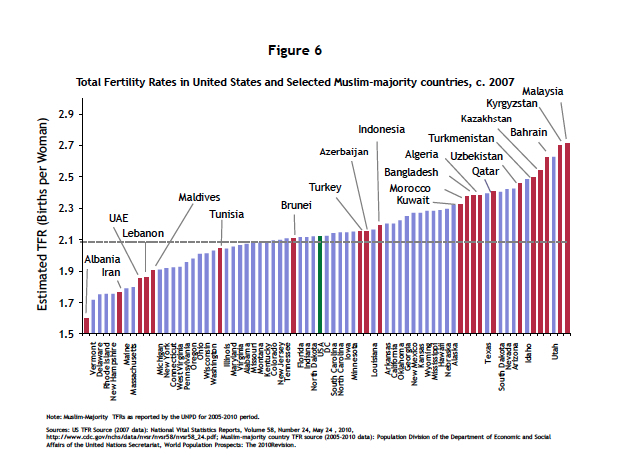 Twenty-two Muslim countries and territories had fertility declines of 50 percent or more. The sharpest drops were in Iran, Oman, the United Arab Emirates, Algeria, Bangladesh, Tunisia, Libya, Albania, Qatar and Kuwait, which all recorded declines of 60 percent or more over three decades. 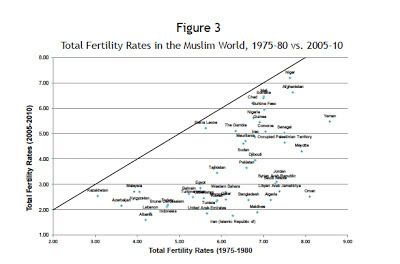 Fertility in Iran declined an astonishing 70 percent over the 30-year period, which Eberstadt says was “one of the most rapid and pronounced fertility declines ever recorded in human history.” By 2000, Iran’s fertility rate had fallen to two births per woman, below the level necessary to replace current population, according to Eberstadt and his co-author, Apoorva Shah. 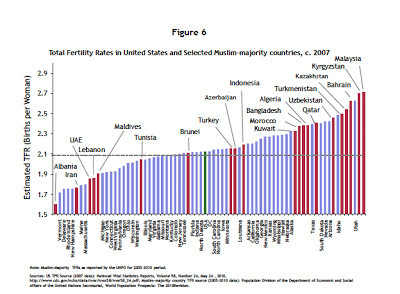 Accompanying this fertility decline is what Eberstadt calls a “flight from marriage,” which he described in a paper presented last month in Doha, Qatar. His data show that in many areas of the world, men and women are getting married later or remaining unmarried. Divorce rates are also rising, especially in Europe, along with the percentage of extramarital births. The decline of marriage in Europe is well-known but still striking: The female marriage rate fell in Germany from 0.98 to 0.59 from 1965 to 2000; it fell in France over that period from 0.99 to 0.61; in Sweden from 0.98 to 0.49; in Britain, from 1 to 0.54. Marriage is also plummeting in Asia: In Japan, the percentage of women between 30 and 34 who have never married rose from 7.2 percent in 1970 to 26.6 percent in 2000; in Burma, it rose from 9.3 percent to 25.9 percent; in Thailand, from 8.1 percent to 16.1 percent; in South Korea, from 1.4 percent to 10.7 percent. Marriage rates in the Arab world are higher, but they’re moving fast in the same direction. What’s “astonishing,” says Eberstadt in an e-mail explaining his findings, is that in the Arab world, this move away from marriage “is by many measures already as far along as was Europe’s in the 1980s — and it is taking place at a vastly lower level of development than the corresponding flights in Europe and developed East Asia. “Something really big is under way — and practically no one has noticed it, even in the Arab world,” argues Eberstadt. I don't what will be the specific impact of these changes - but we can be sure that we will be seeing a lot more changes in the Muslim world in the coming decades. Mass education and globalization via the internet and other sources is already bringing up unprecedented questions about the nature of being a Muslim in the modern world. The traditional structures are being challenged and new answers are being tested. But, in addition, this demographic shift would mean that the youth bulge of today (more than half of the Muslim population today is under the age of 25) will turn into an aging society, and that will bring a whole set of new challenges. Read the full article here and you can find the full study here.